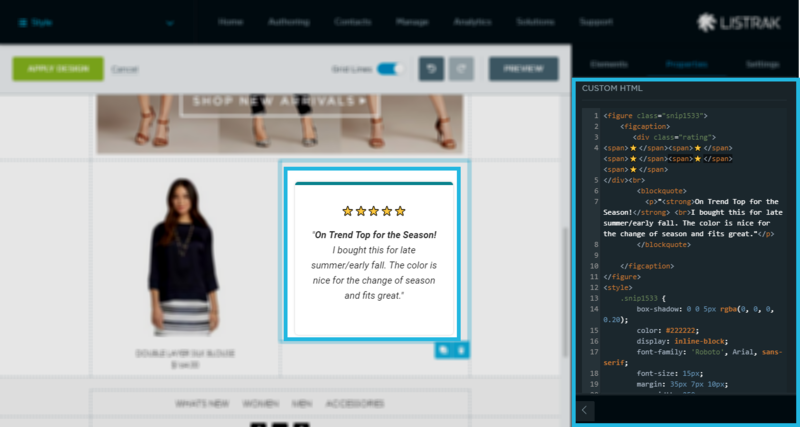 Learn more about how to add HTML to your Listrak Composer built emails and different use cases. 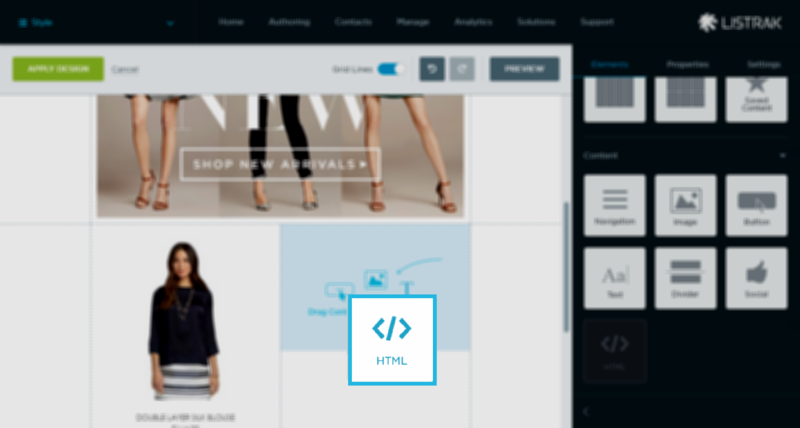 Easily add HTML to your Listrak Composer emails! Adding HTML blocks gives you flexibility to add different elements to your email and even take your email design to the next level. Code at your own risk! Using custom code may affect how the message is rendered. Please be sure to use valid email markup optimized for responsive design. Don't forget to test! Add markup provided by third-parties such as analytics tracking pixels, advertising services like LiveIntent, user-generated content and alternate images from Pixlee or Curalate, Movable Ink, recommendations, and video. Include content created in other Listrak tools such as Contact Content Blocks (CCB) or Recommendations. Add external content into a message using Content URL. Modify the border styling around the content area or apply borders only to certain sides of the content. Build tables with custom column layouts. Add more than four columns for promoting social media pages, brands, and navigation. Create columns with custom widths, background color or gradient, and padding. Take control of custom styled elements such as: navigation, images, buttons, and social media. Build custom text areas with text wrapped images, custom text styles, and mobile styles. Drag and drop the HTML element onto the canvas. Then, click the element to begin adding and editing HTML. Use the arrow in the left-hand corner of the palette to expand the palette to view and edit larger pieces of code easily. Styles can be added inline or as an inline stylesheet. Keep in mind that not all inboxes support stylesheets, so it's best to inline your styles when possible. Wrap your styles in a <style></style> tag. Mobile styles can be added into your stylesheet with a media query. Customization of an entire row or structure, such as: adding a full-width background image or gradient background, adjusting the email width, adjusting the row padding, adding a border or drop shadow outside of the content area. Adding custom CSS styles to the head stylesheet. This may result in not having complete control of mobile rendering. Dynamic Content (DCC) and Saved Content (SC) tags are not supported. Colspans may cause issues with rendering - use a nested table instead. Cart objects, such as the raw cart layout templates located in the Abandonment Settings. Lastly, keep in mind that Composer has its own set of class names. If your HTML is not previewing as expected, please consider changing one or more of the class names present in your HTML.